Christmas is around the corner and everyone is busy preparing to celebrate the biggest festival of the year, also marking its end. This is the time meant to be with family and friends, enjoying the best of time amidst cakes and cookies. While for some Christmas is surely the most fun filled and happening festival, there might be some people around feeling all heartbroken due to their hearing loss. 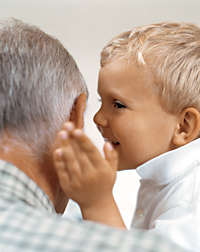 Hearing loss is certainly painful as one fails to hear sounds partially or in some cases, completely. Dealing with hearing impairment leaves one with the feeling of self-pity and lower confidence level. Though one uses different types of hearing aids in order to cope up with the hearing loss but despite that there exists a feeling of gloominess. However, this Christmas, don't let your hearing loss affect your festive mood. Instead, make it a point to enjoy the holidays with utmost fun an frolic. Here check out how you can make the most of your Christmas with your hearing devices on. Be positive: The problem you are dealing with is certainly a saddening one, but always remember that nothing is stronger than your willpower. As you have your hearing devices with you, make the best use of them with all positivity. Don't let your morale go down and never allow the feeling of self-pity gain control over you. Confide in family & friends: The love of family and friends always works as a miracle. Confide in them and seek the moral support that will help you in dealing with the situation bravely. Be in their company as it will keep you occupied and help you rejuvenate. Buy the best hearing devices: The moment you suspect hearing loss, get a hearing test done immediately. Consult a professional and well experienced audiologist and choose for the most appropriate hearing devices. Put on a brave face: Your loved ones will never feel happy if you don a saddening look before them, especially during the festival life. The problem is for sure a persisting one but for the ones you love, get over it for some time and merge in the festive mood. Enjoy a wonderful Christmas making use of your hearing devices and family love!